This potted plant will tolerate bright sun or partial shade and is happy in a range of temperatures, although the flower color tends to be slightly better in cooler temperatures. 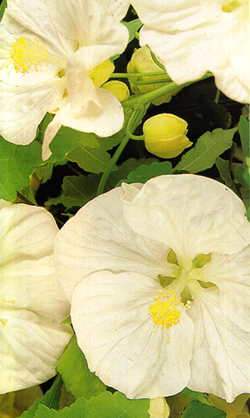 The wide, light green leaves are smaller than most other abutilons, making the flowers seem even larger. Keep the potting soil moist at all times and use standard liquid fertilizer every 2 weeks during the flowering season. You can sow your own seeds and then transfer the seeds to the garden container that you have chosen. Make sure that each plant will have plenty of room to branch and the first growth should appear in approx 12 weeks. When it comes to selecting a container for your indoor plant we recommend one approx 14" to 18" high. This should not only give the root system plenty of room to spread but all keep the plant in balance once it starts to grow. You can use a porous clay like terracotta but make sure there is a saucer underneath to collect run-off. Because of the neutral color of this plant a glazed planter with bold colors is a fantastic compliment. Try to match your decor of country, contemporary or traditional. Make sure the pot is in indirect light and you should have tremendous success.